When you put together a puzzle, every piece has to connect precisely to make it complete. During assembly, you will often look at a picture of the completed puzzle and then visualize the finished version as you put it all together. Email campaigns can be viewed in the same way. You look at a picture of the completed version: an order placed and an invoice generated. But if you miss one piece, a sale may never transpire. 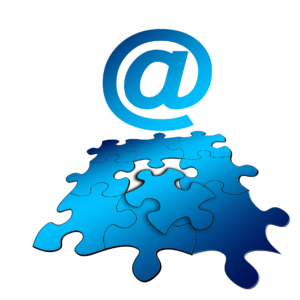 An email, like a puzzle, has several pieces that need to be assembled correctly to make the campaign successful. 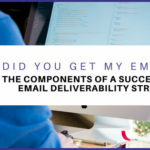 If you are just getting started on email campaigns, read our article on Email Deliverability to obtain essentials and learn what factors go into a successful email campaign. 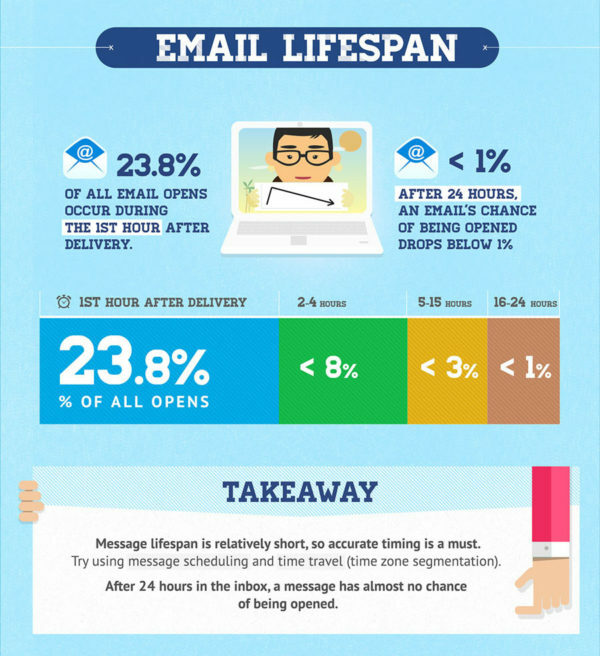 Below are some factors to consider before you decide what is the best time to send your email. The right list – if the audience isn’t correct, forget about it, all is in vain, and your stats will reflect it. Exact reason you are sending the email: newsletter, promotion, product launch, warming up the list, etc. Personalized email, address the subscriber by name. Captivating subject lines to get the email opened. Remember the purpose of the subject line is to get them to open the email, not to sell your product or service. Email content that keeps them engaged enticed and encourages them to take action and to research further. An attention getting and persuasive CTA that gets executed. The final stat is always going to be sales however your email campaign should always bring real value that will eventually lead to a sale, referral or repeat sale. It is important always to consider the lifetime value of a customer. They may not have bought yet but when they do, what if they tell three friends about your product. What does their lifetime value become it they become a repeat customer and refer others to your product or service? 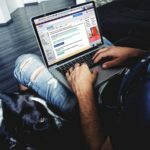 We need to have a starting point, so the best thing to do is to look at what the largest and most successful email marketing platforms have to say after they studied and analyzed their data. Since there are five business days in a week, we decided to pick what may be the five most popular. 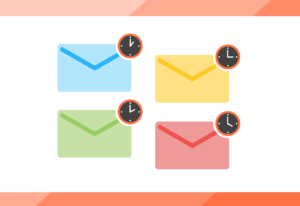 Constant Contact – When Is The Best Time To Send Your Email Marketing Campaign? Based on the data and facts and tips we have accumulated through our research try these 12 tips to launch your campaign and get started. Once you start gathering data, you will be able to hone in on what gets the best response from your audience and adjust accordingly. If you have data already, look at the time when you receive the highest number of sales online. Send your email to your list a short time before your data says you are getting the largest number of sales. 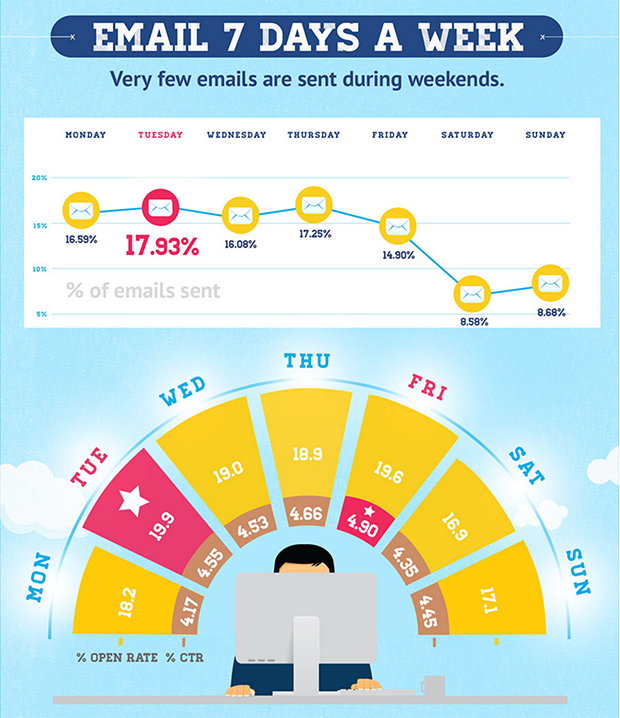 Constant Contact put together a great chart that shows per industry the best time to send emails. The chart is based on statistics in 2015 but may prove helpful in getting you out the gate. If you feel like going against the grain of what everyone else is doing, depending on your audience, send your email on the weekend. 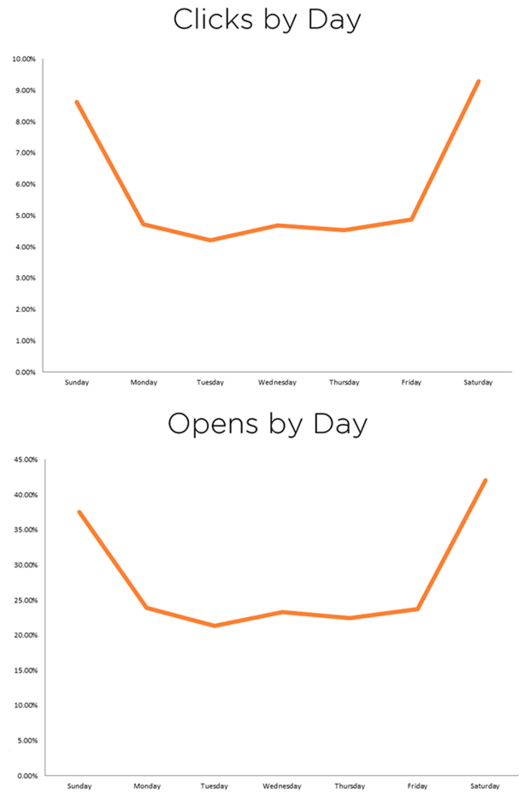 In our research, overall these send times had lower open rates. Time Zones will play a role in the open times. If you want to be savvy, segment your list into time zones and send them all at the same time in each time zone. Some of ESP’s (email service providers) have this feature in place. Virtually every company that has done research said Tuesday in the morning is the best time to send an email. Monday mornings early. The reason for this is many people will check their email first thing Monday morning when they sit down at their workstation. This goes without saying, as soon as someone subscribes send them an intro email. And then keep track when you are getting the most subscribers. 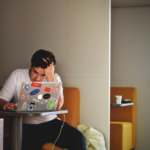 One thing we did not find is that we were not able to find where anybody conducted a survey to ask their audience the best time to send an email. If you do conduct a survey, offer an incentive of tangible value that encourages your audience to participate in the survey. Expect the unexpected every audience, and audience segment will vary. You may also find the best time to send an email by posting an ad. If you post a Facebook ad, see when you are getting the highest response from the ad, Send an email to your audience at the same time you get the highest response. 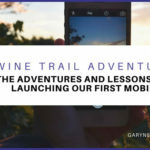 Is your audience reading their emails on a mobile platform? If so, then determine what that time is and send the email then. Make sure your emails are responsive to a mobile platform. According to a post by Campaign Monitor in 2015, What Is The Best Time To Send Email Campaigns, 42% of first opens are on mobile devices. To capitalize on your send times, after each campaign take time to see what times work the best. Depending on the size of your list you may also want to monitor results as the campaign is running to see if you need to make adjustments for future emails in the sequence or future campaigns. 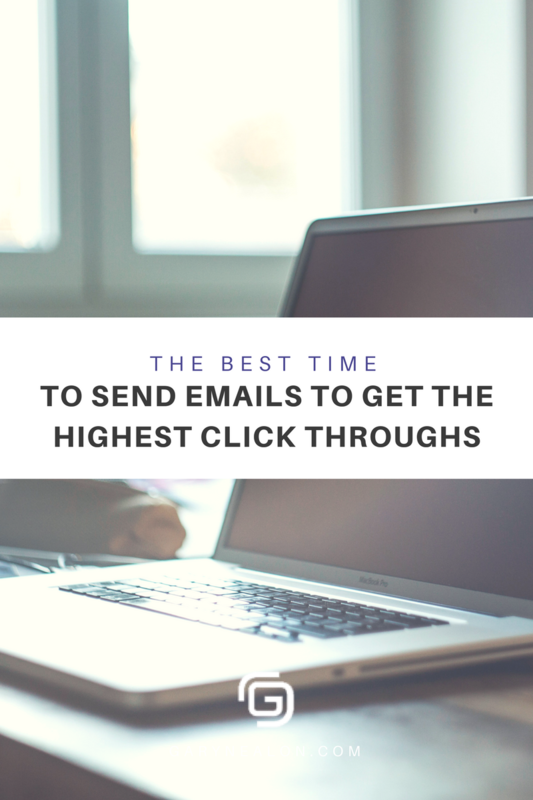 Below is what you want to look for when determining when the best time and day to send your emails. Day and times that has the highest open rates click thru’s, conversions, and sales. Depending on the KPI you are looking for, will determine your new send time. Time Zone your subscriber is located. The amount of time that they have been subscribed.Are they a current customer or one that is still in the funnel. 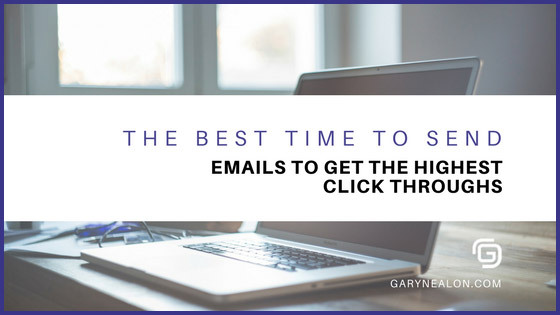 See what the send time was for emails that were followed by a sale. For example, if you highest days for sales is on Monday, it may be because your customer took the weekend to think about the purchase before they pulled the trigger. Make sure you have links to your other platforms in every email you send and invite them to join you on those platforms as well. This will give you another KPI that could help to determine the best time to send. What is the highest segment of time you are getting the highest subscriber rates from other sources such as advertisements, opt-ins on your website, boosts to your Facebook fan page, etc. Is there a particular segment that is not opening their emails, or is a measurable number of them opening at a different time.? If you are getting a low open rate, are there other factors that may be hindering the open rate such as wrong audience or weak subject line? If you are subscribed to a competitor’s mailing list have you analyzed what time you are receiving their emails? Is there a succinct pattern to their send times? Expect that this is going to be an ongoing process. Begin to develop an email testing plan. It is a strategy within your overall strategy that focuses specifically on the best time to sent your emails. You may also develop an email testing plan for other KPI’s. It is always going to depend on the audience you are serving. Consider the results you receive from the times you send your email(s). See if it is a similar timing pattern to post on other media platforms that you are utilizing such as Facebook, Instagram, Blog Posts, Pinterest, Twitter, etc. and conversely, if you see high engagement at specific times on social media, try to see if that is a good opportunity to send email. If someone chooses to unsubscribe from your email list, don’t give up, invite them to like your business page on Facebook, or follow you on Instagram or Pinterest. They have said no to your email list, but that doesn’t mean they have said no to your company altogether. They have already said no once, what are you going to lose if they say no again? Take these four things into consideration as you learn from the data you are analyzing. When you are testing the best send times, Make sure you are focusing only on the best send time and don’t try to add more than one other variant into the equation. Have a plan in place for what you are going to do once you receive the test results. Have the next follow up email or next campaign ready to go so that the time that got the best results is going to be implemented in the next campaign or sequence of the present email campaign. When looking at the best send time, make sure you are looking at the best time for individual segments. What works best for current customers, may not be the same as it is for customers you are trying to acquire. Once you find a send time where you are getting good open rates, on the following tests look at what you can do to increase the engagement or open by adjusting the subject line, subheader, images, call to actions and content. The more data that you extrapolate from individual campaigns, the more you will learn to find what the “sweet spot” is to send emails for that particular campaign. Once you get some data accumulated from your initial campaign and you have analyzed and reviewed what you learned….send out another campaign with the parameters of what you have concluded from the previous campaign. 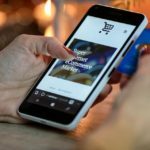 In today’s business environment much of the decision-making process to decide whether or not to move forward with your brand occurs long before they make it to your checkout page or pick up the phone to contact one of your representatives. This is why it is important not to take the importance of email marketing lightly and specifically, the send time. With this one component of your campaign dialed in, you will be able to increase the probability of gaining a customer or retaining a customer and influencing a repeat sale or potential referral. To accomplish all this, we need to focus on the details.Effective email marketing is a science and the send time is one of the pieces of the puzzle. The good news is that once you get this piece right, the rest will fall into place. I have not seen a statistic on this, but I am sure there is a high percentage of people responsible for sending out campaigns never take into consideration the best time to send out emails to their audience, even after they have enough measurable data. At the end of the day, after all, factors are considered, and you still don’t know when your audience is going to open your email…SEND IT NOW…do not hesitate. By sending it now, you will begin to gather data to find the best time to send later. Your email campaigns will never be perfect don’t let that stand in the way of not taking any action. 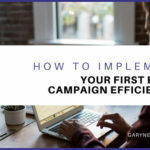 The more campaigns you run, and the more you analyze and extrapolate data from each campaign the more precise and successful your campaigns will be. Send the email – now is the time.